Ok Google should not okay certain things for your children! That is where “Ok Google Children” will come in and make sure that you’re still in charge. This modification will allow a parent to register users of the device so those under the age set will only access the information that you believe is best for them. You will also make sure “Google” helps them with words of the day, history facts or other educational fun items and then send a musical reward for the right answer like a favorite song or character speaking to your own child. 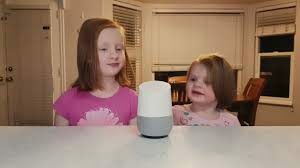 With Ok Google Children your child will be entertained for hours without fear that they are learning the wrong lesson.